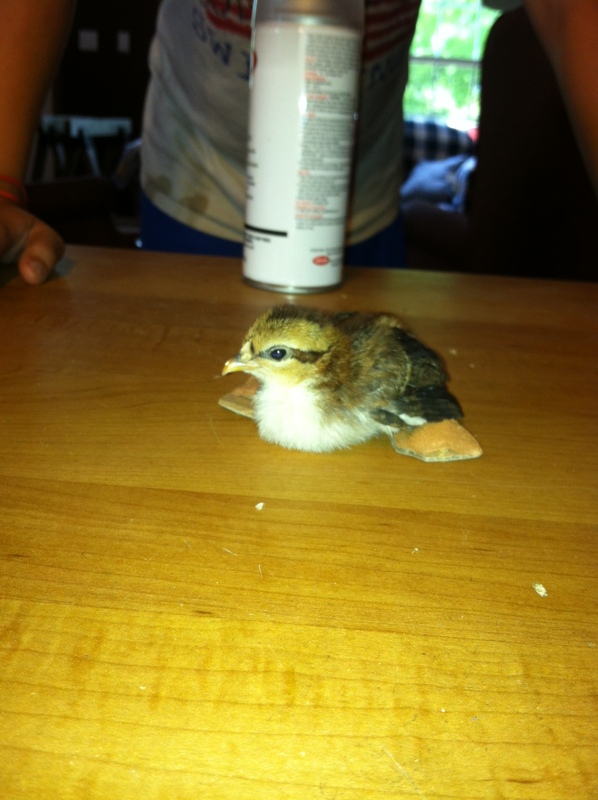 This is 3 of the 5 chicks Scarlett hatched. 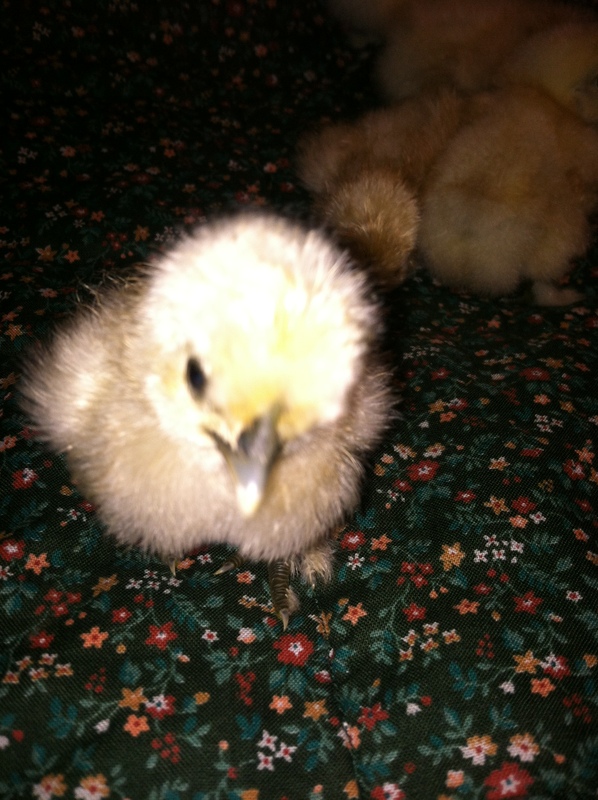 The black ones came from my polish/bantam cross Cilla. Well it’s started off to be a very soggy day. We had an awful storm pass through this morning at 3 am, because the thunder woke me up. And it looks like it’s going to be a wet,wet day. Although this is great news for the garden, it’s not so great for my Chicky babies. I hate to see them out there sloshing in all the big puddles, but I guess they don’t mind to much because they don’t really even try to get out of the rain. They have a huge porch they can get under but they seem to like to just keep going about their business of foruging and running around. some of my wee ones did get a little soaked yesterday, so we are keeping them inside for today. I have 20 eggs going into lock down on Saturday. 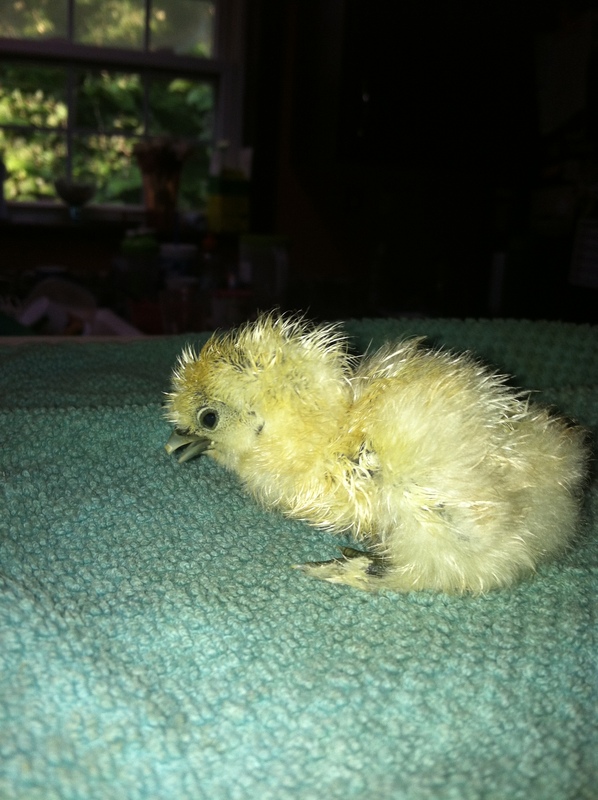 I am so excited to maybe getting some more chicks. I will have to probably sell some of these guys though. Nick is going to have to get busy working on some more coops too. They are a bit crowed at night and I want them all to have plenty of room. The rain is actually helping right now with the flies. I just cleaned the coops on Saturday and they already need to be cleaned again. The flies are awful, but I have found a few ways to try and help keep them down a bit. I am going to try them today and I will report back on how things go. Hope everyone has a great and productive day. Another busy weekend down and now another start to a busy week. We had a great weekend. Got most of the fence up around our garden and I just saw that our peas are starting to grow pods. I believe we will have peas in a week. Yummy!! I have sugar snap and early peas growing. I just hope we have enough so that I can freeze them so they will last longer than last year. We had some awesome arrivals this weekend! 5 of the 7 eggs I had in the incubator hactched and now we have 5 new silky chicks. They are the cutest little things. 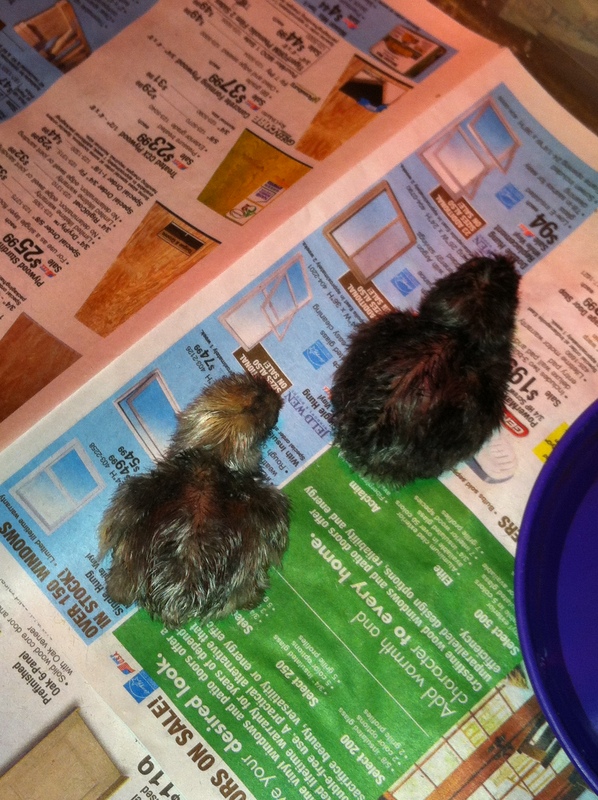 I was so nervous Saturday night I almost couldn’t sleep, but alas they finally started hatching at 5 am. It’s just like new babies to come in the wee hours of the morning. I have another 20 in the incubator with a hatch date of June 9 and another 22 with a hatch date of June 22 and Scarlett, my Silky hen is sitting on 6 eggs right now with a hatch date of June 16, which is just 2 days after my sons 15th birthday. I think I have caught the hatching bug or something. I plan to set 12 eggs almost every week. That way I can have some newbies every week or so. I did have 3 eggs that didn’t hatch and I am planning on doing eggtopsies on them later today. I want to know at what stage the embryo stopped developing or if their was an embryo at all. This is all very new to me and it is all a very big learning process. But I feel that a 80% hatch rate on my first hatch is not bad at all. Our newest arrivals. Just hatched yesterday!! 5 out of 8 is not a bad hatch. What a crazy busy weekend. What can I say. Friday night we went back to Dinky’s and I got 12 new laying hens and 4 new baby silky chicks that are approx. 5 weeks old. I call them the Fantastic 4, because they never want to be a apart. If one gets lost or left behind it will let out it’s distress call until the others find it or it finds them. It is really kinda cute the way they stick together. The other chickens I got are all laying hens. I got 8 RIR crosses, 1 easter egger (Patty), 1 Golden laced Wyandott (Goldie), 1 Buff Orpington (Buffy), and 1 Speckeld Sussex (Heidi). They are all great and friendly birds and don’t seem too timid at all. Some will even come up to me, and several have come pecking at the back door like they want to come in or something. ANd most of them are laying eggs daily. I should be able to actually start selling some eggs soon. Foghorn, my young White Leghorn started crowing over the weekend, which I thought was pretty cool. I can tell it’s him too, because it’s still kinda weak and he doesn’t do it very often yet. 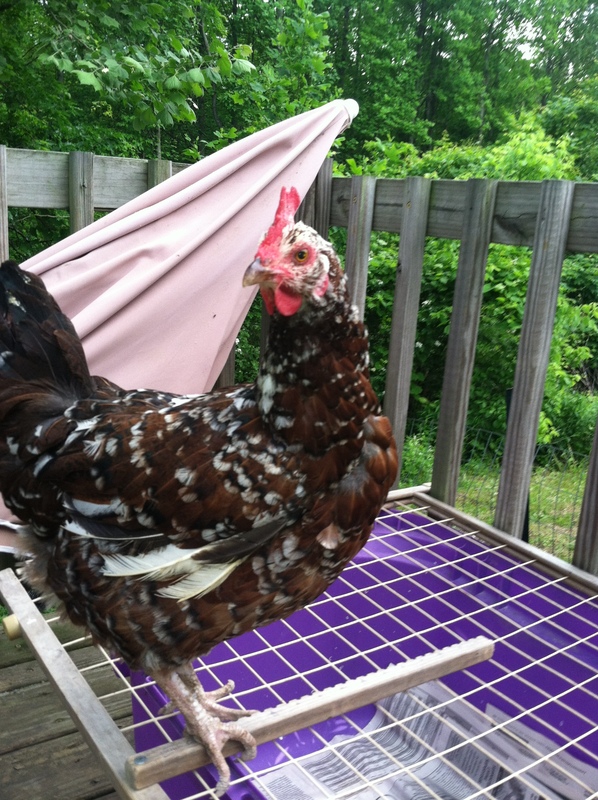 I got rid of Harry, the little bantam rooster (the bully), and things have quieted down so much. He would crow all day and get the others crowing too. Now Peta is the one who crows the most, but only for a little while and maybe a few times in the evening. It’s not an all day thing with him. I think it’s because they all know now that he is top ROOSTER! so they don’t even bother too much. I do have to say that the backyard is quite nosie in the mornings now though because of the girls. They cackle and make noise for most of the morning. Come afternoon though they all quiet down and it seems quite peaceful. 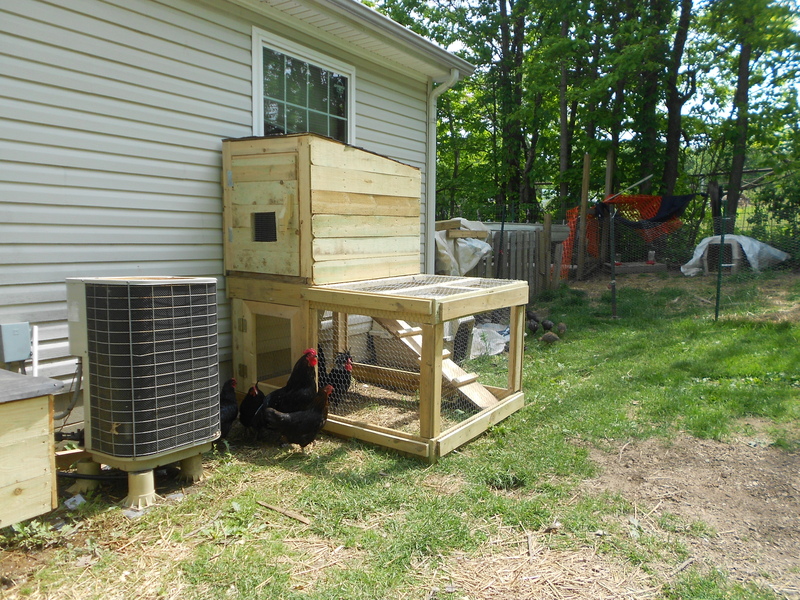 Because of the new hens, Nick had to make a new roosting box. It’s very simple, and I made nesting boxes for them, that way they can just roam the backyard. They really like it under the back deck too, but they haven’t laid any eggs under there yet. I also got 41 pepper plants and 20 strawberry plants in the ground this weekend. Today I am going to work on the cucumbers and squash. I am also going to plant a few cantalop for my father in law and sister in law, found out over the weekend they love it and I have tons of those seeds, who knows maybe I will even be able to get my kids to eat them. I hope everyone has a great day, it’s sure to be a busy one. I must say that I am super excited. 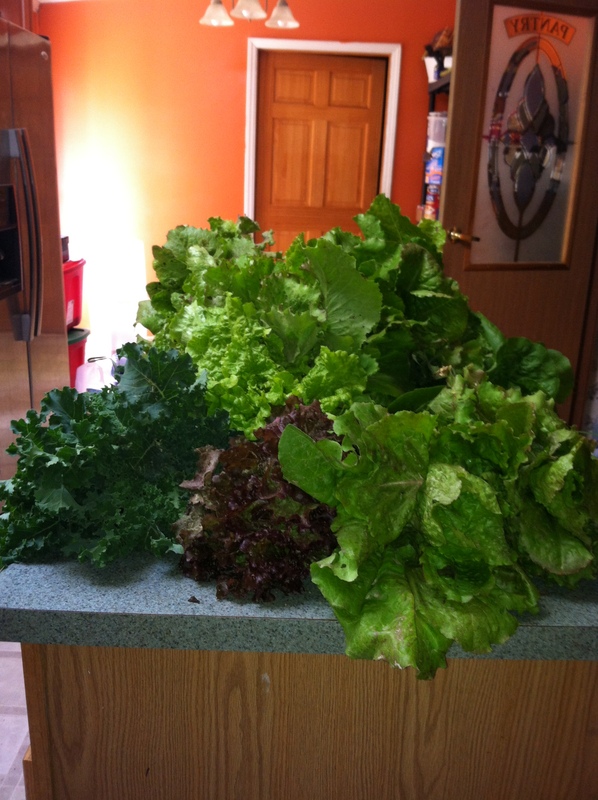 I harvested all my lettuces, collards and other greens last night, and man did I get a lot. I started out with my usual garden basket and ended up having to use the wheelbarrow. It took me most of the night just to get it all washed off. Today I am going to bag it all up and get it ready to sell this weekend. Hopefully at the Farmer’s Market and in my front yard. I am also going to try and get some tomatoes ready to go for sale. I need to make some $$$$, We are going to Dinky’s tonight. I’m hoping we can find some stuff to help with all the coops we are building, I would also like to get just a few more laying hens. I’m thinking of taking a few of the ones I bought a few weeks ago back and trying to resale them. Bella, unfortunately hasn’t laid a single egg for us in 2 weeks, I’m thinking she might just be old. and Harry, the little banty rooster is just plain annoying and he is a bully to the other birds.I’ve read that it is best to just get rid of the bullies and things will calm down. I guess we will just have to see….. It has been a busy few days on the homestead. Nick finished the second coop yesterday. It’s for Elvis, I’m going to call it the “Jungle Room”. Cause you never know who is going to end up in there with him. I was thinking of putting him with Scarlett for a little while. I think a polish/silky cross would be pretty and interesting. I set another 20 eggs in the incubator last night, 2 off the eggs go into lock-down tonight with hatch day being set for Sat. and then the 8 other eggs go into lock-down next Thursday. I’m kinda hoping to keep it going like a revolving door, because I don’t know how many eggs will actually hatch. I am trying to build up a stock, so I can have more birds, more birds, means more eggs. 🙂 It also means more work, but I can deal with that. The kids will be out of school soon and then I can get some help around here. Duty calls….. Have a great day.